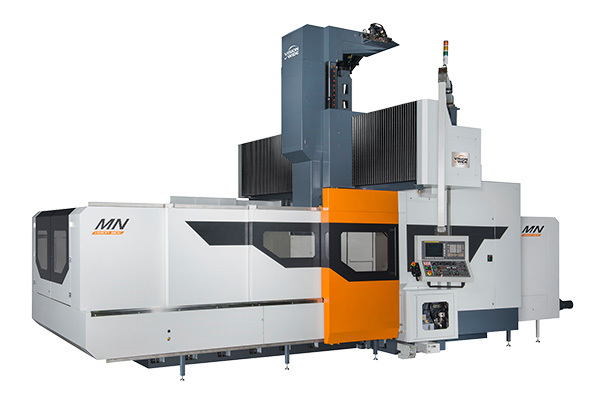 MN series machines, with typical VW products features of rigid structure and high precision, are designed with 5-face function of multi-angle cutting and X-Y roller ways structure. It speeds up 3 axes rapid traverse and increases the machine's efficiency of utilization. Solid beam with big cross section and roller ways design strengthens the stiffness of Y-travel. Wide base with 3 roller sliding ways improve the load capacity and dynamic accuracy. Box structure of headstock with 6 guiding roller blocks, and 1- 1.4 meter Z-travel keeps stiffness and minimizes the interference between spindle and work piece, carrying the complete function of 5-face cutting. High efficient power transmission is made by well arranged spindle motor position and short shaft device. AC: automatic clamping for diversified head attachment.